After labouring long and mightily, we filed the copy for the Pachauri piece in good time yesterday. Ironically, though, we been defeated by the weather. The great exposé on the global warming scammer has succumbed to, er ... global warming? Actually, it is more prosaic. The heavy snows have hit the retailers hard, right at what would be the height of the January sales. Thus, there have been massive cancellations of display adverts in the newspapers, which in turn has triggered a crisis in what we used to call Fleet Street. Thus, tomorrow, The Sunday Telegraph, in common with other Sunday newspapers, is having to scale back production and cut back the size of their papers. Our piece, therefore, has been held over until next week. That said, we have some stunning revelations to make – we have clearly landed some blows and there are white flags flying in certain quarters, with "Patchy", as he likes to call himself, squealing with indignation about a "vendetta." However, perforce, I am in purdah for the time being. My lips are sealed and the blog must remain silent for a week on Patchygate, not through any legal intervention – white flags are being run up the mast in that quarter as well – but simply, I have to give the newspaper the first crack of the whip. What we have uncovered though, is only the start. I suggested some time ago that this is so big, it is of staggering proportions. 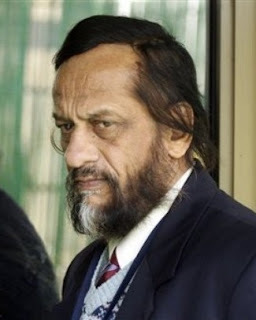 Dr Pachauri and his sidekick, Mrs Robins, aka Ms Ritu Kumar, are only the tip of an extremely large and unsavoury iceberg. The warmists had better hope for colder weather, as we are intent on doing some ice melting of our own. Oh! And it's snowing here - again.